As part of the tour of the newly opened myVillage at Serangoon, we were invited to sample a variety of dishes at several eateries. 1st stop, Shin Kushiya. Shin Kushiya specialises in Kushiyaki, which refers to the Japanese cuisine of grilling meats and vegetables on bamboo skewers. Shin Kushiya uses Bincho charcoal from Japan. Apparently this special charcoal can reach over 1000 degrees celcius, which is key to providing a crisp delicious smoky flavour to the food while still being able to seal in the natural flavours and juices. This cooking method is supposedly a very healthy way of cooking because no additional oil or flavour enhancers are used. I have to admit, I’m not very schooled in Kushiyaki cuisine, the only other time I had that was at JooJoo’s at Joo Chiat. My knowledge of Japanese food is pretty much limited to what I eat at Sushi Tei and Sakae Sushi, albeit on a very regular basis. 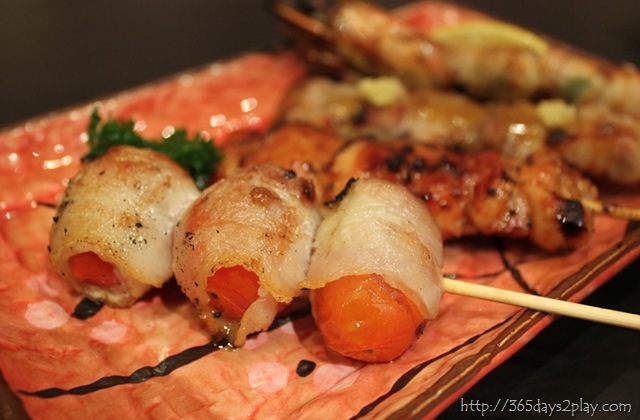 What I can say is the freshness of the ingredients used in the Kushiyaki really comes through. There is no heavy sauce to cover up any imperfections. The food is light but the flavours are natural. 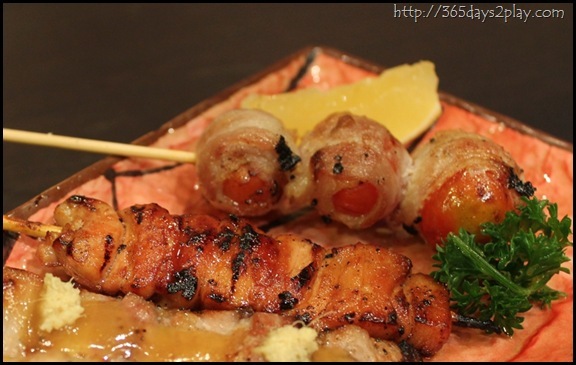 Tomato Maki (Cherry tomatoes wrapped with thinly sliced pork $2.80 – This is really a classic combination. The sweet sourness of the tomatoes really paired well with the salty sliced pork. The tomatoes were so juicy, the flavours were just waiting to burst out as I enjoyed each little tomato. If you don’t order anything else, you definitely have to order this. Ebi Shiso Maki (Whole sea prawn wrapped with thinly-sliced pork and shiso leaf) – $3.60 Very tasty and succulent. The sliced pork felt a little fattening when combined with the prawn. Buta Bara Yaki Miso Ginger (Three-layer pork belly with miso-ginger marinade) $2.80 – That’s the one right at the bottom of the picture. Once again, damn good. Everyone at the table finished theirs in like 10 seconds. Black Pepper Yakitori (Black pepper soy-glazed chicken) $2.20 – I loved the black pepper glaze! 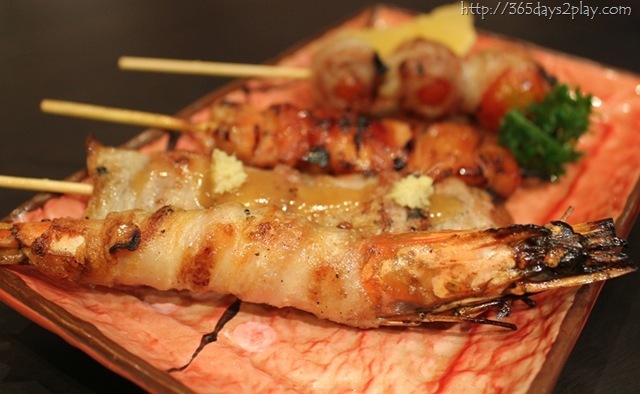 Just in case you were wondering, Yakitori refers to Kushiyaki using chicken as the ingredient. 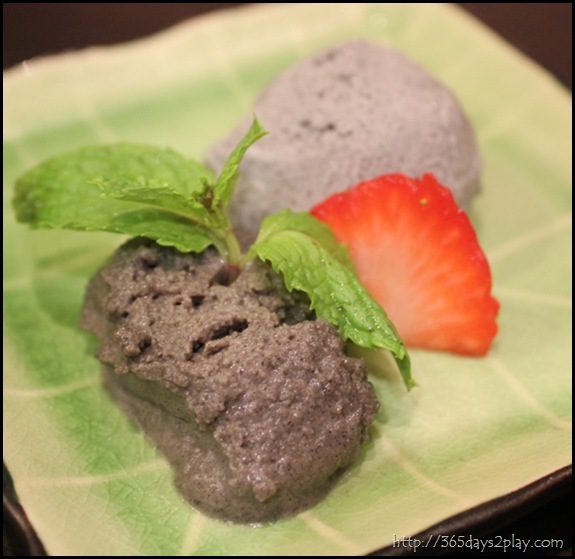 Kuro Goma Heaven (Black sesame ice cream with homemade black sesame cream) $7.80 – I am not that big a fan of black sesame fillings when it comes to chinese desserts. Surprisingly, I loved the flavour of this ice cream. 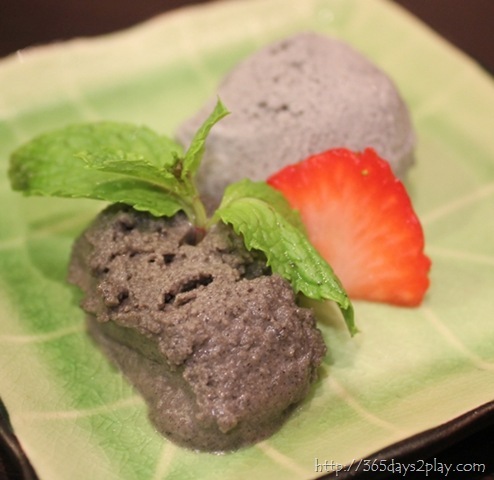 It’s like eating green tea ice cream, you either love it or hate it. 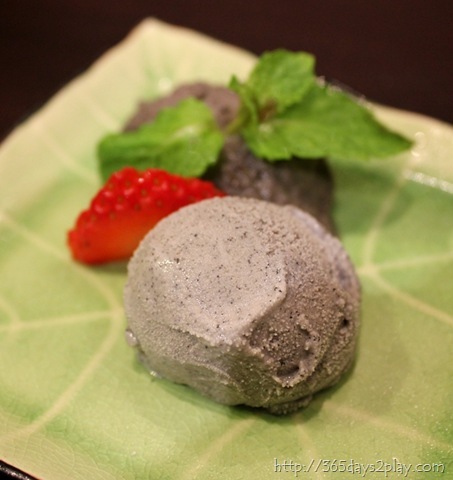 The taste of the sesame is not ovewhelming, but enough that you definitely know you’re eating black sesame ice cream! Believe this is not the full size of the ice cream if not $7.80 would be really pricey. 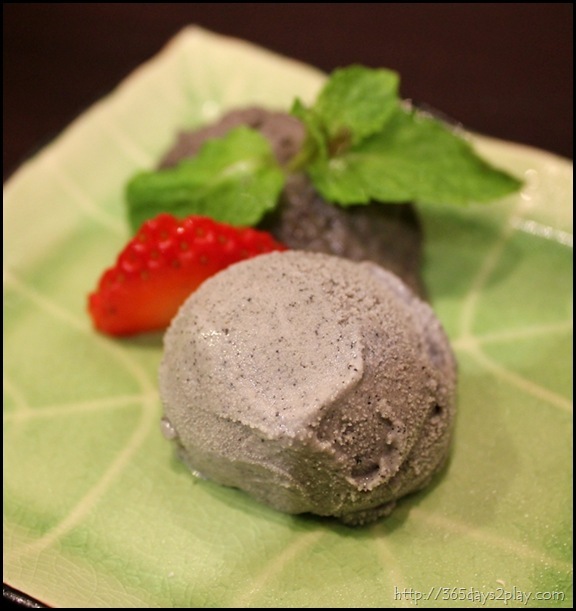 This black sesame cream thing had quite a dense and somewhat ‘bouncy’ texture. Tastes good, but I don’t mind trading in this for a bigger scoop of the ice cream. The Partner, being the type of person that needs gargantuan effort to like our local/asian desserts, didn’t really fancy the black sesame ice cream. 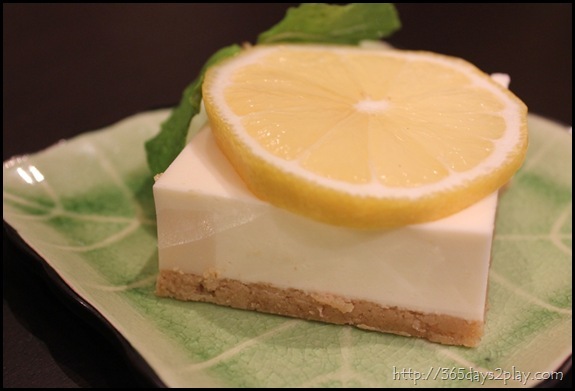 So Shin Kushiya offered him a tofu cheesecake. It was the 1st time he had ever tried such a thing, and I’m glad to report he loved it very much. Welcome drink. Made with some Japanese fruit and has a really strong citrusy flavour which I think is a really suitable drink to perk anyone up. Strangely reminds me of Kickapoo, only better. (A) Grand Opening Lunch Set Promotion! (B) Grand Opening Dinner Promotion! I have never tried Japanese grilled meat before but your photos are enticing me. The tofu dessert has intrigued me too. It’s good, try it! Especially since you like the mall so much. looks absolutely yummy!! I can’t wait to try it. 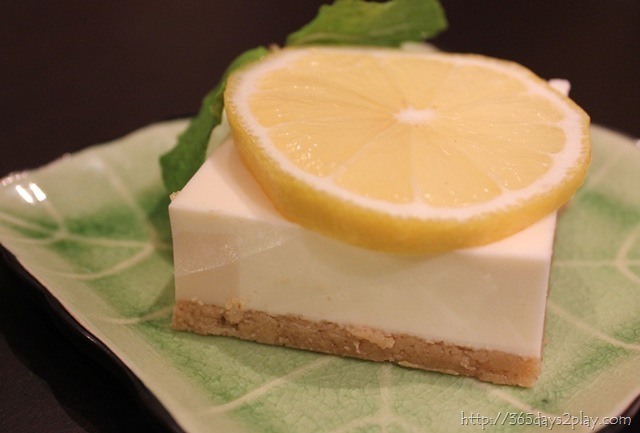 Have you tried Sun with Moon’s (wheelock) tofu cheescake? I love it there!! 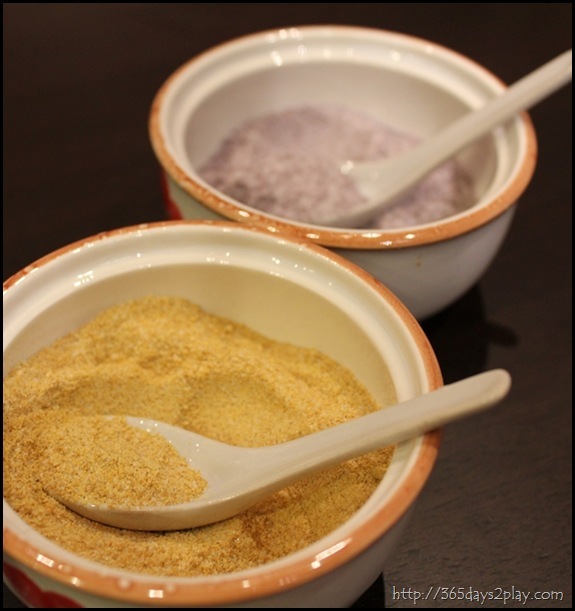 Kushiya refers to the style of cooking? Ah but it looks so fattening X( !! haha.